We’re doing fun activities every day this December leading up to Christmas to celebrate advent and today’s excitement was all about fudge. And my husband even got in on the action because the baby needed fed when my daughter and I were in the middle of prepping. Might I say he is one mighty good-lookin’ whisker. And I bet we have the smoothest fudge ever. Good job, honey. This fudge recipe is delicious. Seriously. And sooooo easy. It takes no more than 15 minutes to prepare, including chopping the chocolate. Anyone can do it, and you can even get a little arm workout in the process. That’ll be your excuse for eating many, many pieces of fudge. Because I promise you’re going to want to. Butter an 8 x 8 square baking dish. Set aside. Cook sugar and milk at a medium boil, whisking constantly, for 5 minutes. Remove from heat and add the remaining ingredients. Whisk like a pro until you have it blended well. Pour into your buttered dish. ***Do not scrape the sides or bottom of your saucepan, just pour into your dish. Then you can scrape the sides and bottom into a separate bowl and, well, just see how long that lasts. We went ahead and ate the extras with spoons while it was still warm. Merry Christmas, tummies. Your welcome. 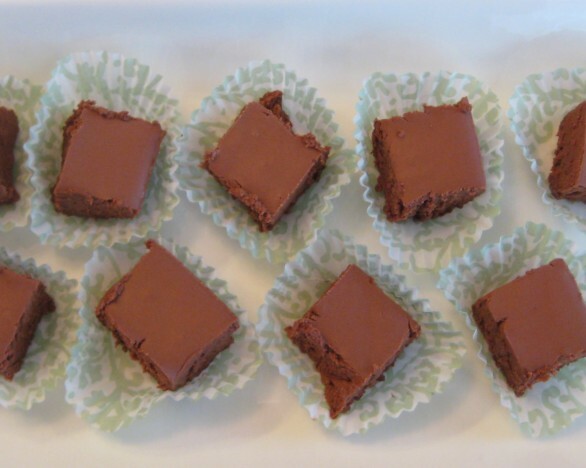 Cut fudge into squares once it\'s cooled and enjoy or give it away and really make someone\'s day. Since I had the pleasure of eating way to much of this and I already know that it is delicious I definitely have to try it on my own!